The subject of 2 Corinthians 3:18. The first descriptions of New Jerusalem are in Revelation 21:2, 9-11. Here the city is the bride, the wife of the Lamb, is from God, and has the glory of God. The city is also holy, heavenly, and bright. Since these characteristics are presented first, they must be the most important, but Revelation 21 goes on to reveal much more about New Jerusalem. 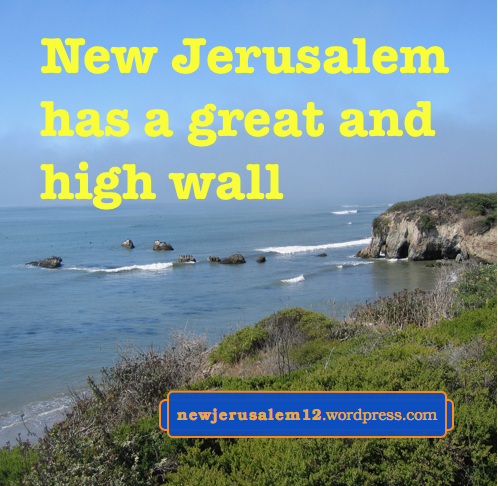 The great and high wall clearly defines what is within New Jerusalem and what is not. Every member of New Jerusalem was chosen by God in eternity past, has partaken of Christ’s redemption, has been regenerated, and has completely experienced a process of renewing, transformation, conformation, and glorification. By the time of Revelation 21 every chosen person has fully passed through all of this and is inside New Jerusalem as an integral part of the city. By this time there are no unprepared people, no partially prepared people, and no almost ready people. Besides establishing the boundary of New Jerusalem, the wall, great and high, also protects God’s interests within the city. Later verses in Revelation 21 show that the wall is built with the Spirit’s transformation work in the believers and that the wall, of jasper, expresses God. By believing into Jesus Christ we are inside the wall as part of New Jerusalem, and by the Spirit’s transforming we are the stones which build the wall. In Christ Jesus we have redemption, the forgiveness of our sins, through which we become sons of God. This redemption has been fully accomplished and is eternal. This is the first step on our path to New Jerusalem. Based on redemption, we become sons of God by His life entering into us. This is the new birth, the regeneration, of our spirit. This life gradually spreads into our soul to renew and transform us*. Now, as Christians, “who have the firstfruits of the Spirit, even we ourselves groan in ourselves, eagerly awaiting sonship, the redemption of our body” (Rom. 8:23). We already are sons of God, but we are in the initial stage of sonship. We eagerly await the full sonship, “the redemption of our body.” This is the second step of redemption on our path to New Jerusalem. This will transpire at the Lord’s second coming. Ephesians 1 tells us that we were sealed with the Holy Spirit “who is the pledge/ guarantee of our inheritance unto the redemption of the acquired possession.” God is our inheritance both today and in a fuller way when our body is redeemed. We need to cooperate to reach this goal. Ephesians 4 cautions us, “do not grieve the Holy Spirit of God, in whom you were sealed unto the day of redemption.” The Spirit is working in us to transform our soul, to prepare us for the redemption of our body and take us unto New Jerusalem. We hinder this work and grieve the Spirit when we disobey the Spirit and live according to the flesh. * See verses (and footnotes) in Rom. 12:2, 2 Cor. 3:18, Eph. 4:23, Titus 3:5. John declares in Revelation 21:2, “I saw the holy city, New Jerusalem, coming down out of heaven from God, prepared as a bride adorned for her husband.” New Jerusalem is a corporate person, the bride of the Lamb, Jesus Christ. This bride is adorned. Let us use the Bible to determine what this adorning is and is not. Paul, in 1 Timothy 2:9 exhorts “that women adorn themselves in proper clothing with modesty and sobriety, not with braided hair and gold or pearls or costly clothing.” Here the genuine Christian adorning is not outward decoration but proper virtues*. We should apply this to our expectations for New Jerusalem. The gold of the city is not physical gold but a sign (Revelation is a book of signs) of the divine nature which saturates the city. Likewise the pearl gates are not physical but portray the death and resurrection of Christ through which we enter the city. Additionally, the precious stones are not something of human jewelry but display the transforming work of the Spirit in all the believers. This work causes the city to have the appearance of jasper (Rev. 21:11) which is also the appearance of God on the throne (Rev. 4:3). The adorning of New Jerusalem is the Triune God Himself wrought into all believers and shining out through them. By partaking of the divine nature, the gold (2 Pet. 1:4), experiencing the death and resurrection of Christ as our pearl (Phil. 3:10), and participating in the transforming by the Spirit (2 Cor. 3:18) to make us precious stones, we become constituted and adorned to be New Jerusalem to manifest the Triune God. * More on this in the next post. New Jerusalem, the bride of the Lamb, is composed of all God’s chosen, redeemed, regenerated, transformed, and glorified people. God’s choosing determined that we are on the path to New Jerusalem. Although we were among fallen men, Christ’s redemption brought us back to God and regeneration gives us God’s eternal life, the life of New Jerusalem. TRANSFORMED: Regeneration is to be born of the Spirit in our spirit, as the Lord spoke in John 3. Transformation is the spreading of divine life into our soul to renew our mind. This renewing is also our transformation (Rom. 12:2). This is based on our consecration (Rom. 12:1) and is accomplished by our cooperation with the Spirit’s work in us and is “unto glory” that is, unto New Jerusalem, the city of glory. GLORIFIED: Transformation develops God’s glory within us. However, transformation is in our soul and the expression of glory is still constrained by the body of our humiliation (Phil. 3:21). Glorification, transfiguration, is the divine life saturating our mortal body so that it will “be conformed to the body of His glory.” This is “the redemption of our body” which is the full sonship. This glorification will occur when the Lord returns, “When He comes to be glorified in His saints and to be marveled at in all those who have believed” (2 Thes. 1:10). 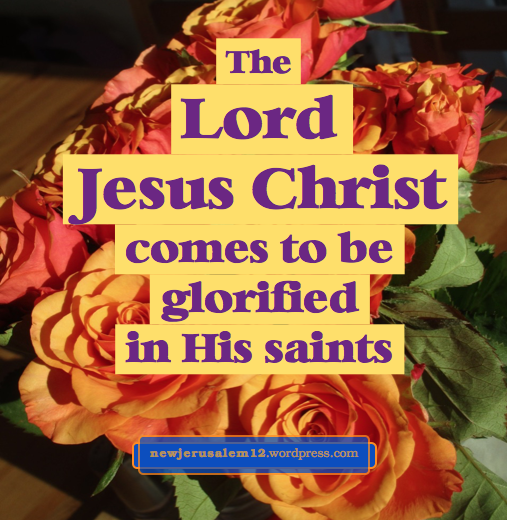 This, our glorification, is “the Lord of glory” (1 Cor. 2:8) whose glory we “behold and reflect” (2 Cor. 3:18) throughout our transformation, saturating our entire being and radiating through us that all may behold. Jesus alone (John 2), then all His believers (2 Cor. 6:16), consummating in New Jerusalem, is the living temple. The Bible also has a material, physical temple, a shadow, a portrait of this reality. This shadow shows us the good, heavenly things to come in Christ. But what need was there for that shadow? The reality came, and through His redeeming death and life-imparting resurrection we can participate in this reality. We have no more need for shadows! The shadows came because of the fall, but we can receive some spiritual vision from them. This is somewhat like the saying, a picture is worth a thousand words. The physical tabernacle and temple, the shadows, show us something about the living temple including New Jerusalem. One thing we see is that the Old Testament temple was constructed with gold, wood, and stone. This is a picture of God’s New Testament building, including New Jerusalem, built with the divine nature, the humanity of Jesus, and the transformed members of His Body. The dimensions of the tabernacle and temple show us that the Holy of Holies, their innermost chamber, is a cube. These cubes demonstrate that New Jerusalem, a cube (Rev. 21:16), is the eternal holy of holies. Furthermore, the fact that the whole of New Jerusalem is the holy of holies tells us that we all have been fully brought into God’s presence. Wonderful! Romans 12:2 exhorts us “be transformed by the renewing of the mind that you may prove what the will of God is, that which is good and well pleasing and perfect.” This good, well pleasing, and perfect will is ultimately to bring forth New Jerusalem. This consecration comes out of the foregoing chapters of Romans—realizing that we, as fallen, natural men, cannot please God but need His life in us to enable us to be people for His purpose. We cannot transform ourselves. Second Corinthians 3:18 tells us that we are transformed by beholding the glory of the Lord; He is the source! Ephesians 4:23 says we should “be renewed in the spirit of our mind.” Our transformation is by renewing and our renewing is accomplished by the Spirit in our spirit. 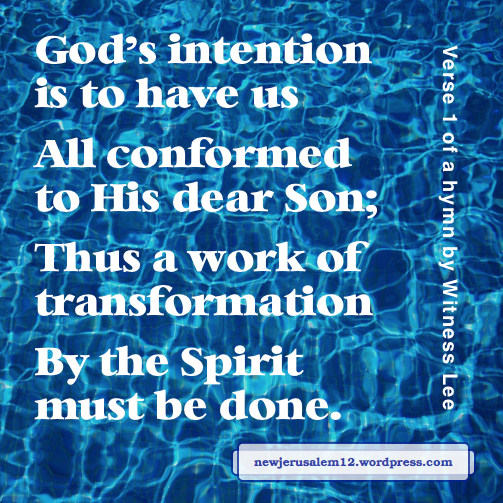 The first verse of a hymn (music) by Witness Lee speaks of God’s intention, His will, and our consequent need for transformation (see graphic in this post). The fourth verse of the hymn, based on 2 Corinthians 3:18, presents something of God’s goal. ____To His image He conforms. New Jerusalem, radiating the glory of God (Rev. 21:11), is the fulfillment of God’s will. The chorus is a good prayer for each of us. ____All our being wholly fill. The hymn is © 2001 by Living Stream Ministry, used by permission. New Jerusalem is heavenly in nature but in position it is on earth. John saw New Jerusalem “coming down out of heaven from God” (Rev. 21:2, 10). The phrase “out of heaven,” twice in Revelation 21, means it is no longer in heaven. Matthew has multiple verses speaking of the “heavenly Father.” New Jerusalem is heavenly because the Father, the source of life, is heavenly. Through regeneration we received this heavenly life so that we can grow up to be the heavenly members of New Jerusalem. 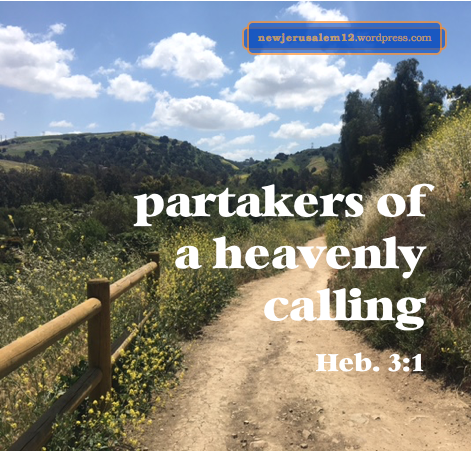 Believing in Jesus Christ for our new birth is our response to the “heavenly calling” which has come to us and of which we are now partakers (Heb. 3:1) . We are called to Jesus Christ, to God the Father, and to the heavenly city Jerusalem. First Corinthians 15:49 declares, “even as we have borne the image of the earthy, we will also bear the image of the heavenly.” We have the earthly image because, as human beings, we have an earthly life. Now we have been reborn of a heavenly Father, and are being transformed into His image. This transformation is presented in 2 Corinthians 3:18, “we all with unveiled face, beholding and reflecting like a mirror the glory of the Lord, are being transformed into the same image from glory to glory, even as from the Lord Spirit.” As we behold the Lord, His glory is infused into us to develop this glorious, heavenly image in us. This matches New Jerusalem, which “has the glory of God” (Rev. 21:11). Photo courtesy of Heather Martin. In considering what will not be in New Jerusalem I was attracted to Luke 16:9 where the Lord Jesus tells us that money, the mammon* of unrighteousness, will fail. There will be no money in New Jerusalem. All forms of human wealth are corruptible and unrighteousness and generate greed, as in the following verses. Hence no money, no human wealth, will be in New Jerusalem. Do not imagine that the gold, pearls, and precious stones in the description of New Jerusalem in Revelation 21 are corruptible physical riches. No. These represent precious, divine materials: God’s nature, Christ’s redemption, and the Spirit’s work in us. The Lord concludes His speaking in Luke 16 about unrighteous mammon saying, “No household servant can serve two masters; for either he will hate the one and love the other, or he will hold to one and despise the other. 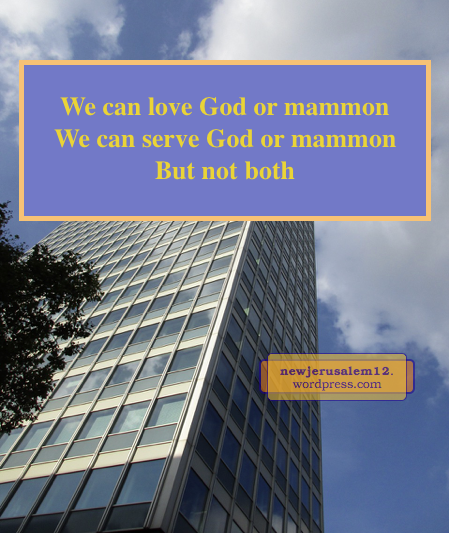 You cannot serve God and mammon.” Let us declare, Lord Jesus, I love You; I give myself to serve You. Lord, save me from mammon. 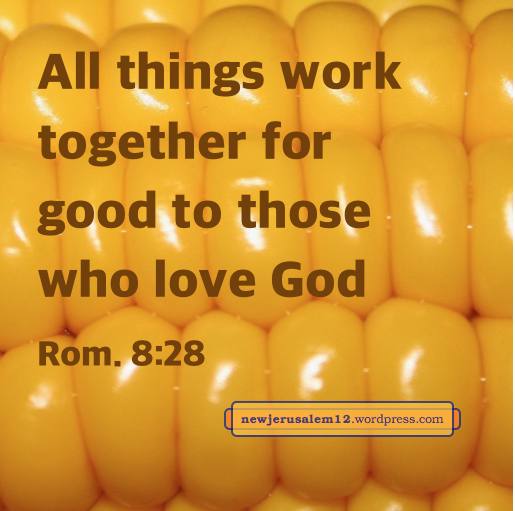 Here are my other “NO” posts, showing what is NOT in New Jerusalem. Verse 3 begins with the rich flowing of God’s life. This flow is portrayed by the river in Genesis 2; the reality is the Spirit as rivers of living water in John 7; and the consum-mation is the Spirit as the river from the throne in New Jerusalem in Revelation 22. This flow of eternal life transforms us into precious stones and conforms us to Christ for God’s building today and for New Jerusalem. Verse 4 of the hymn speaks of God mingling with man, making His home in us, and becoming our content so that we can share His glory and express Him. Here is one New Testament verse touching each of these points. 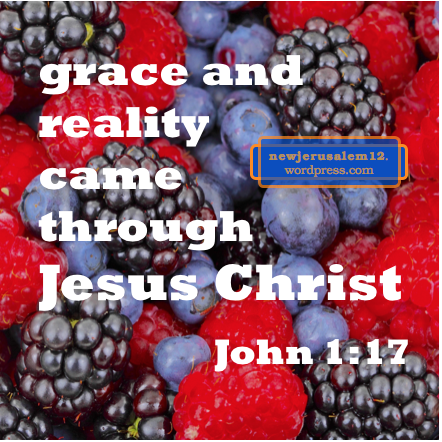 It is by Christ as life in us that we become God’s expression, both in this age and in New Jerusalem. God created man to express Him in life. He is not looking for a static expression like a work of art. We are living stones to be the house, the temple, of the living God (2 Cor. 6:16) to serve Him by His life. The Christ we live becomes the Christ we express, today in some limited degree and in New Jerusalem in full. Here is a summary of recent posts on Christ as the chosen, living, and precious Stone and His believers as living, precious stones. These stones are for God’s building today and for New Jerusalem. Christ is the Chosen, Precious, Living Stone – In 1 Peter 2:4-8 Christ is a chosen, precious, living Stone. In Acts 4 and Eph. 2 He is the Cornerstone in whom we are built together. We All are Living Stones for New Jerusalem – The Lord is the living Stone. By coming to Him, we become living stones for the building of God’s house today (1 Peter 2:4-5) which will grow into New Jerusalem. New Jerusalem Like a Precious Jasper Stone – God on the throne in Revelation 4 has the appearance of a jasper stone, and the whole city has the same appearance. New Jerusalem is the corporate expression of God on the throne. Precious Faith Brings Forth Precious Stones for New Jerusalem – The precious faith we have received enables us to lay hold of the precious promises given to us by God (2 Peter 1:1, 4). By these we are constituted precious stones. New Jerusalem Displays the Beauty of Christ – The twelve precious stones on the foundations of New Jerusalem, and the appearance of the whole city as a most precious jasper stone, display the beauty of the unsearchable riches of Christ. Precious Stones Adorn New Jerusalem – The preciousness is not external but is by the Spirit’s working within us. Transformation Produces Precious Stones – The Spirit’s working within us transforms us so that the preciousness of Christ may be expressed through us. Precious Stones on the Foundations – The twelve foundations each correspond to one precious stone; these declare the eternal perfection and fullness of the wall. The Stones Express God – The whole of New Jerusalem, its wall, and its first foundation are all jasper, expressing the God who sits on the throne.